For most aficionados of America's Cosa Nostra, the starting point is always the war between Joe "The Boss" Masseria, pictured above, and Salvatore Maranzano. Much about the early Mafia seems open to debate. For instance, we'd thought Maranzano created each crime family's boss, underboss, consiglieri, capo, solder and associate pyramid structure, based on the Roman Legionnaires, though recent research suggests these positions were already in place. Maranzano, however, named himself Boss of Bosses and it was his doom. Lucky Luciano did away with that title after doing away with Maranzano. It was agreed no one man would ever hold that title, though over the years, some bosses seemed to fit the bill on an informal basis nevertheless. Carlo Gambino was definitely one of them. According to First Family: The Birth of the American Mafia by Mike Dash, the Morello family was the first Mafia family -- Mafia as in the criminal organization based in Sicily; men who belonged to the Mafia emigrated to America, usually to escape the clutches of Italian law, and simply brought to America what they were doing in the Old Country. Counterfeiting was big back then, as well as extortion, kidnapping and robbery. Soon enough, three other families had formed. And they were formal, organized and carried rituals, such as "making" new members -- they weren't a loose net of street gangs. The three new families were the Schiros and the Mineos, who stayed in Brooklyn, fearing to move in on Morello's Manhattan turf; and the D'Aquilas, led by Salvatore "Toto," who were the most formidable of the new families. Toto staked his claim in Manhattan alongside the Morellos. Fearless and intelligent (and while the Clutch Hand was still in prison) D'Aquila solidified his position and became even more powerful than the Morellos. The American Mafia soon had a war on its hands: The Camorra, the Neapolitan version of the Mafia, soon moved in and took on the Mafia for control. However, they found themselves unable to take over Mafia rackets that easily, especially those belonging to the Morello family (whose leader was still in prison). People outright refused to be extorted by the Camorrists, fearing the wrath of the Clutch Hand when he returned. As Dash wrote, "Without the Barber (the nickname of this informer, Ralph Daniello) the Neapolitans would almost certainly have won their war with the Sicilians, and reduced the Harlem Mafia to a criminal irrelevance, with incalculable consequences for the history of crime." The Camorra would never again be a force in New York's underworld. And eventually, more Sicilians emigrated and there was soon a Fifth Family, led by Umberto Valenti. By the time Morello got out of prison in 1910, the world had indeed changed for him. These original Five Families would soon see their end as well. But the Mafia we know grew from seeds planted in those earlier families that we don't know. Joe Masseria, for example, emigrated to the United States in 1903 to avoid murder charges in Sicily. He became an enforcer for the Morellos, then set up his own shop in the 1920s when Prohibition had arrived. More families were formed and there was complete chaos. So much money was at stake. The small-change rackets of the Morello family days were nothing compared to the money in bootlegging, which would make millions of dollars for some mobsters, previously unheard of sums in the underworld. The Morello family gradually disappeared as they were slowly squeezed out, but Morello, the first godfather, was not ready to retire. The Clutch Hand put pride aside and ended up joining with Masseria, who had the manners of a pig, but was outfighting everyone else. Morello became his consiglieri, though I don't know if they called it that back then; he was widely considered the brains of Masseria's outfit. Who had more experience in the American Mafia than the man who had created it and led the first family decades earlier? Guided by Morello's steady, seasoned hand, Masseria knew who to kill, as well as how and when and in what order. When open war broke out between Masseria and Salvatore Maranzano, Maranzano knew who his first target would have to be if he had any hope of winning: Morello. And so it was done. 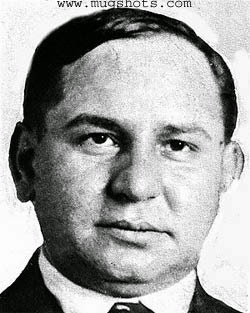 Morello was assassinated in his own office in Italian Harlem on August 15, 1930. The first Godfather lay on the floor, bleeding from holes in his face, jaw and body, just another dead Mafioso. Eventually both Masseria and Maranzano would end up in the same position as a new generation of Mafiosi, whose names are well known today, took over. As a sidenote: The often-told story of Masseria's end -- his lunch with Lucky -- and slaying by gunmen bursting into the restaurant while Lucky was in the men's room is supposedly fiction. It never happened. It's a little simplified to call the early groups families. They were gangs, usually based on their local roots in the Old Country. The one gang that spun off the leaders of modern organized crime was the Five Points. At the Turn of the Twentieth Century, their boss was Paul Kelly, who had taken the Irish handle to smooth the transition from the formerly all Irish gang to the immigrating Italians like Lucky Luciano. Kelly's given name was Paolo Vacarelli. History is never as simple as it is sometimes made out to be. I have Dash's book, but haven't had a chance to read it yet. I look forward to doing so.